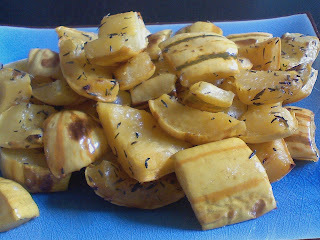 Just made a batch of delicata squash, my first attempt after always just bugging my mother to make it for me. First I should tell you that it's kind of hard to get delicata squash- stores usually only have it for a short time and then they usually only get a small amount. I found this squash in Whole Foods and snatched up 4. They're small, like the size of a large potato, and yellow-ish. Scoop out all the seeds- a grapefruit spoon is great for this. You can cut the squash into long quarters or bite-size chunks. If you choose chunks, try to make them all the same size so they cook at the same rate. I threw all the pieces into a large bowl, drizzled them with olive oil and then tossed with my hands to make sure they were all coated. Go easy with the oil- I use a little too much today. Sprinkle with thyme, dry or fresh. I only had dried today. This makes your house just filled with a yummy smell that fits with autumn perfectly. I also sprinkled with some salt. Bake at 425 degrees for 35 minutes or until the squash is soft. It should also brown nicely.